Special Containment Procedures: SCP-014’s holding cell is to remain locked at all times. Personnel of sufficient clearance (as determined by facility administrator) may be admitted to view SCP-014 after submitting a formal request three (3) weeks in advance. Anyone handling SCP-014 must undergo Special Precautionary Protocol 014-2. All personnel exposed to SCP-014 must be subsequently subjected to a forty-eight (48) hour quarantine and psychological evaluation. And after exposure, common sense dictates that one should wash their hands. 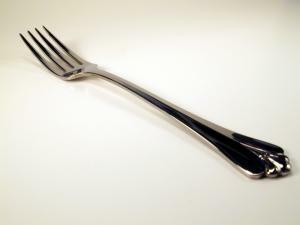 Description: SCP-014 takes the form of an antique dinner fork, well worn, and, as near as can be estimated, not cleaned since the 1890s. The object is fashioned from the electroplated nickel-silver typical of the suspected period of its manufacture and the rightmost tine is bent █████████ (██) degrees outward. Brown stains and mold adorn the prongs and the pits of the decorative parts of the handle. Analysis of this material seems to indicate that SCP-014 was last used on some form of beef. SCP-014 was moved to this facility in the early 1970s and seems, for all intents and purposes, to be an entirely mundane dinner fork. If it is possessed of any extra-ordinary qualities, these are known only to those in the very highest echelon of this project’s coordinators, whose representatives assure us that SCP-014 is, quote, “Very Important”. Officers who have spent time alone with SCP-014 are unanimous in their appreciation that the object is of great significance (hence its continued presence at this site), though none can quite say why [see »Testimony of Major ██████ ██████████, February, 1972]. No tests on SCP-014 are authorized. Any personnel observed attempting to compromise SCP-014 in any way are to be terminated at once.